Rising life expectancy is leading to an increasing number of patients with age-related diseases, including neurodegenerative disorders such as Alzheimer’s disease (AD). One of the hallmarks of AD are elevated markers of oxidative damage, as increased concentrations of oxidized nucleic acids, proteins, and lipids have been found in AD brains. Vitamin E is an essential antioxidant micronutrient and plays an important role in protecting cells from oxidative damage, such as the harmful effects of free radicals observed in brain aging and AD. Animal studies showed sufficient evidence to consider a treatment with vitamin E for patients suffering from AD. However, the results of clinical studies on AD patients are conflicting. To date, there is no convincing evidence from meta-analyses on randomized, placebo-controlled trials that vitamin E alone or in combination with other antioxidants prevents the progression or improves cognitive function in people with mild cognitive impairment (MCI) or AD. Additional research is needed to explore the effects of vitamin E treatment on other clinically relevant outcomes, such as quality of life. 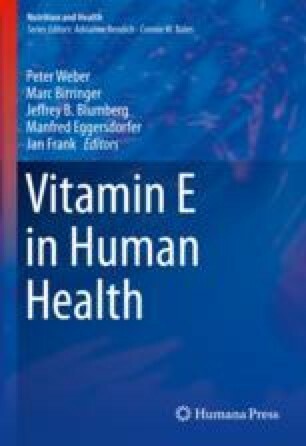 Furthermore, and in addition to the practical challenges when conducting randomized trials among older people with AD, key issues that need to be carefully considered for further vitamin E therapy trials include dosing, timing, mono- or multimodal therapy, and selection of different vitamers including γ-tocopherol and tocotrienols. Amanatkar HR, Papagiannopoulos B, Grossberg GT. Analysis of recent failures of disease modifying therapies in Alzheimer’s disease suggesting a new methodology for future studies. Expert Rev Neurother. 2017; https://doi.org/10.1080/14737175.2016.1194203. Bjelakovic G, Nikolova D, Gluud LL, Simonetti RG, Gluud C. Mortality in randomized trials of antioxidant supplements for primary and secondary prevention: systematic review and meta-analysis. JAMA. 2007;297(8):842–57. https://doi.org/10.1001/jama.297.8.842 [pii]. Borg J, Chereul E. Differential MRI patterns of brain atrophy in double or single transgenic mice for APP and/or SOD. J Neurosci Res. 2008;86(15):3275–84. https://doi.org/10.1002/jnr.21778. Brewer GJ. Why vitamin e therapy fails for treatment of Alzheimer’s disease. Lovell MA, editor. J Alzheimers Dis. IOS Press. 2010. https://doi.org/10.3233/JAD-2010-1238. Citron M. Alzheimer’s disease: strategies for disease modification. Nat Rev Drug Discov. 2010;9(5):387–98. https://doi.org/10.1038/nrd2896 [pii]. Farina N, Llewellyn D, Isaac MGEKN, Tabet N. Vitamin E for Alzheimer’s dementia and mild cognitive impairment. Cochrane Database Syst Rev. 2017;18(4):CDC002854. https://doi.org/10.1002/14651858.CD002854.pub5. Fata G, Weber P, Mohajeri M. Effects of vitamin E on cognitive performance during ageing and in Alzheimer’s disease. Nutrients. 2014;6(12):5453–72. https://doi.org/10.3390/nu6125453. Lott IT, Doran E, Nguyen VQ, Tournay A, Head E, Gillen DL. Down syndrome and dementia: a randomized, controlled trial of antioxidant supplementation. Am J Med Genet A. 2011;155(8):1939–48. https://doi.org/10.1002/ajmg.a.34114. Manoharan S, Guillemin GJ, Abiramasundari RS, Essa MM, Akbar M, Akbar MD. The role of reactive oxygen species in the pathogenesis of Alzheimer’s disease, Parkinson’s disease, and Huntington’s disease: a mini review. Oxidative Med Cell Longev. 2016; https://doi.org/10.1155/2016/8590578. Morris MC, Schneider JA, Li H, Tangney CC, Nag S, Bennett DA, Honer WG, Barnes LL. Brain tocopherols related to Alzheimer’s disease neuropathology in humans. Alzheimers Dement. 2014; https://doi.org/10.1016/j.jalz.2013.12.015. Muller, DPR. 2010. Vitamin E and neurological function. Mol Nutr Food Res. https://doi.org/10.1002/mnfr.200900460. Ouahchi K, Arita M, Kayden H, Hentati F, Ben Hamida M, Sokol R, Arai H, Inoue K, Mandel JL, Koenig M. Ataxia with isolated vitamin E deficiency is caused by mutations in the alpha-tocopherol transfer protein. Nat Genet. 1995. https://doi.org/10.1038/ng0295-141. Smith, MA, Zhu X, Tabaton M, Liu G, McKeel DW, Cohen ML, Wang X, et al. Increased iron and free radical generation in preclinical Alzheimer disease and mild cognitive impairment. Lovell MA, editor. J Alzheimers Dis. 2010;19:353–72. https://doi.org/10.3233/JAD-2010-1239. Torres-Aleman I. Mouse models of Alzheimer’s dementia: current concepts and new trends. Endocrinology. 2008;149(12):5952–7. https://doi.org/10.1210/en.2008-0905 [pii]. WHO. World report on ageing and health; 2015 September, 1–260. https://www.who.int/ageing/events/world-report-2015-launch/en/. Ziegler-Graham K, Brookmeyer R, Johnson E, Michael Arrighi H. Worldwide variation in the doubling time of Alzheimer’s disease incidence rates. Alzheimers Dement. 2008;4(5):316–23. https://doi.org/10.1016/j.jalz.2008.05.2479.